Software is an exciting sector where the rewards for innovation, creativity and hard work can be spectacular but mixed reports of extremely high revenue multiples for “unicorn” software businesses and more modest earnings multiples for other software opportunities can be confusing. 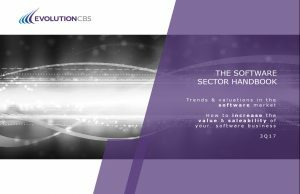 In this detailed report EvolutionCBS has analysed valuation trends from global software transactions and condensed our knowledge of the software sector to deliver invaluable insight and tangible advice that helps you create a truly valuable software business. The software market is one of the most active M&A sectors with volumes reaching more than 1500 deals in 2015 and 2016. Annual deal volume since 2015 has been static – deal volume for 2015 and 2016 peaked at similar levels, reaching 1573 and 1562 deals respectively. However, 2017 is set to see a significant increase in total software transactions. At the end of 3Q17 there were 1316 transactions which represents a 14% increase over the same period in 2016 and 14.8% increase over 2015. Total deal value has increased since 2015. This is supported by analysis of the average revenue and earnings multiples. Both average revenue and EBITDA multiples are on the up. In 2017, the average revenue multiple increased by 68% over 2015, and the average EBITDA multiple increased by 63%. This indicates a buoyant market with an increase in deal volume and prices being paid.